Ask fellow campers about "Victoria City Park" and nearby attractions. very nice city park. off the beaten trail. 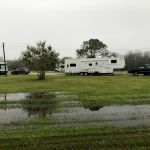 6 fairly large sites, the others are similar to an rv park. you can't go wrong stopping here. We camped at Victoria City Park in a Motorhome. City park with 18 sites, all pull-through and gravel with full hook-ups. It is first come, first served and had one open spot the one night we stayed. It is self-pay by envelope with cash or checks, we did not see any park personnel. No amenities such as restrooms or showers, there is a dump station. The electric was fine, we did not hook up to water. We had Verizon cell signal. Very quiet even though it is located next to a road. We felt safe here and would stay again. We camped at Victoria City Park in a Fifth Wheel. Full hook-up pull-thru sites with generous space between sites. There is a paved walking/biking path on the other side of the canal/creek that can be accessed from the city street at each end. Peaceful and quiet, very little traffic noise for a city this size. We do occasionally hear a train a few blocks away. You are allowed 30 days in any 6 month period. We will stay again. We camped at Victoria City Park in a Motorhome. Drop box at entrance with envelopes for payment. They do ask that you pay on a daily basis even if you are staying longer. There is also a trash dumpster in that area , so away from the campsites. No wifi, but for $12 a night it is a GREAT place to stay. You can only stay for 30 days. We came to avoid the cold and joined the local gym to get back into shape. We camped at Victoria City Park in a Fifth Wheel. Go to Venturas on Tuesday for $.99 chicken tacos or Wednesday for $.99 beef tacos. Stayed twice in December 2015. 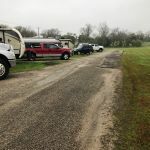 Very nice full hookup RV park. Long pull throughs spread far apart next to a creek. On the edge of the city park and golf course. Many deer roam the park. We will stay there every time we are in Victoria. 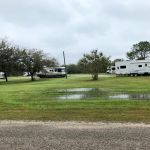 We camped at Victoria City Park in a Travel Trailer. Nice municipal RV Park. Traveling thru on the way to Brownsville, stopped for the night. Long pull-thru sites, 20/30/50 amp electric, good water & easy to access sewer at the site. For the cost $12, excellent value. We camped at Victoria City Park in a Motorhome. While in Victoria, go enjoy a game of croquet at the Bridge Street Croquet Club, 1302 N Bridge St, Victoria. Ph: (361) 218-6832. bridgestreetcroquet dot com. Lots of fun and can be competitive. Also take the time to visit all of the many historic homes and the County Courthouse. Will return again! Very small park. Very convenient. Gravel pull-throughs. Find your spot, read the lot number on the electric outlet box, take a pen, go to kiosk where there are envelopes, fill out the envelope and put in $12 for each night you are staying. Place envelope in the box. There is a crew that does come around to check on the grounds. There is a nice cement sidewalk around the outside to go for walk or bike ride. We saw about 18-20 deer on the property at dusk and early morning. A beautiful site. Trees are quite small but it is well kept. There was someone that must have stayed the winter in a very plain looking trailer with a wrap around the water hose. He wasn't there much. It is also near the cemetery. We camped at Victoria City Park in a Fifth Wheel. We have been staying at the City Park off and on since 2006. Anytime we come to Victoria, we stay here. It is a nice quiet area, considering Vine Street runs by the park. Occasional Trains are heard from a few blocks away. The sites are level, no overhanging tree limbs. The electric is good. Pull through sites with adequate distance and several half moon pull through sites. The only thing we don't do is leave items outside because this is an open park and no visible security other than other RV'rs. We will return when in the area. No restroom or shower facilities. Stay is limited to 30 days. We camped at Victoria City Park in a Motorhome. 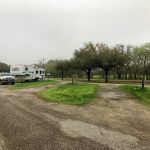 If you're looking for a LOW COST campground, this is it! As mentioned by everyone else, there are no frills, but at $12 a night for full hookups, this is a great place to stay overnight or for a few days. We got the last campsite when we arrived in the early afternoon during a weekday. We had driven by two other campgrounds in the city but at over twice the cost and campsites close as SARDINES, this is BY FAR the best place to stay in Victoria. If you have a toad or are going to unhook and you have a long 5th wheel, you'll have a bit of difficulty. We have a 39' 5th wheel and were staying for a few days, so when we unhooked we had to park sideways and a little on the grass. If we had stayed hooked up we would have just barely made it into the campsite. We camped at Victoria City Park in a Fifth Wheel. This is a nice park. It is a no frills park. No restrooms or showers. It has full hookups and the power boxes are new and up high to make it easy to use. There are no facilities for children. There is pleanty of room between sites, sites are level and long enough to handle our 38ft fifth wheel and pickup. No one at the entrance to take money, you just put cash or check in an envelope and place it in a deposit bin. Get here fairly early because it was almost full by 6 pm. We would stay here again when we come by. Maximum stay is 2 weeks. Weekly cost is $60. Quiet except for one train about 6:30 pm. Address is 2000 N. Vine. GPS location N28.81537 W97.00861. BC We camped at Victoria City Park in a Fifth Wheel. No frills, great site to visit Victoria or just passing through. Small but plenty of room. Lots of wooded areas around. Plenty of grass for dog walking. We saw about 15 deer just before dark. They were still around the next morning as we walked. We will definitely stay here again. We camped at Victoria City Park in a Motorhome. This is the best kept secret in Victoria. Quiet clean park, only $60.00 a week. Great place to stay overnight or for a week. Close to sights. We camped at Victoria City Park in a Motorhome. This park is located some blocks right of business Hwy 87 and W Red River Road. It is close to Riverside Golf Course. It has no restrooms or showers but some 20 full hook up sites. There is a garbage bin on each site. You have to deposit your fee in a box: $ 12 a day or $ 60 a week. The money is collected every morning as the garbage is. It is a wonderful little place. We spent three nights here and will come back. We camped at Victoria City Park in a Motorhome. Are you affiliated with Victoria City Park ?